You know you need an elevator maintenance plan — but do you know how to weigh the pros and cons of your options? 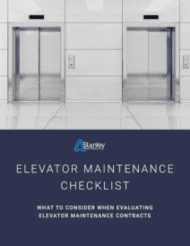 Download our free Elevator Maintenance Checklist to use as a guide while you evaluate your contract options. Compiling everything into one easy-to-use checklist will help you visualize your options and decide on the one that’s best for you. In what state are you looking to purchase or service an elevator? We respect your privacy. Your email address will never be shared with any 3rd parties. Nor will we send you unsolicited emails.